I looked at chapter 2 pg 5 and it looks as if the IP is supposed to be cut up into 3 sections to fit F28 on the same foam. I didn't notice this untill I had the entire IP traced onto the 2 pieces of foam I glued together. 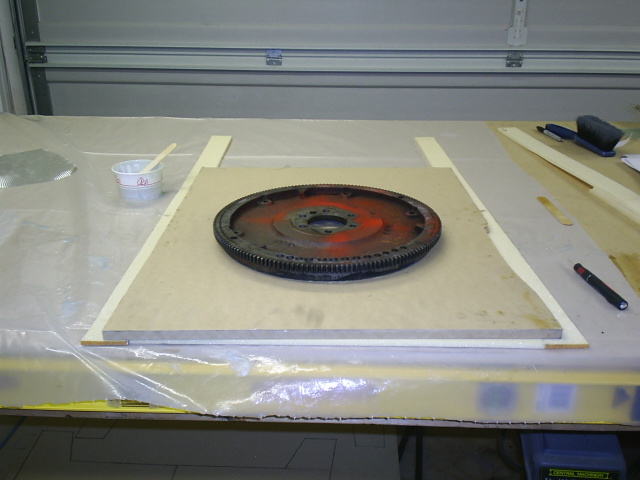 Is it necessary to flip the foam over and re cut the M drawing and trace it that way, or can I just buy an extra piece of foam for F28? The IP just barely fits on the 2 pieces of foam, but it is all there. I have also heard about people needing to add 1/4" to the bottom of the IP to make it fit the fuselage, is this a necessary modification? I don't mind re doing anything, I just want it to be right. 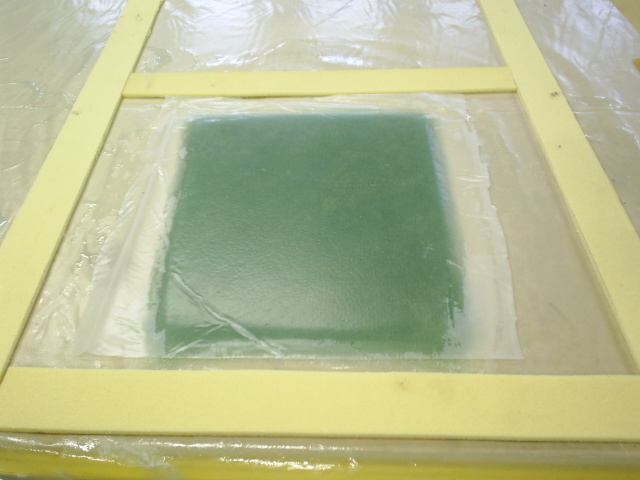 You can 5-minute epoxy as many pieces of foam together as you need to make a bulkhead. 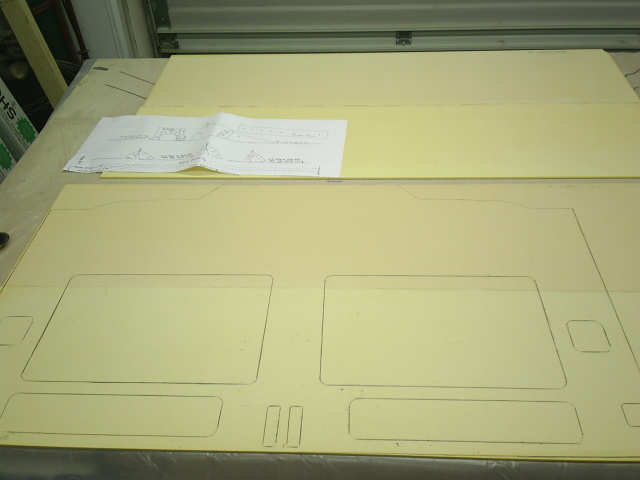 Don't bother redrawing, just add foam as needed to complete the bulkhead's. 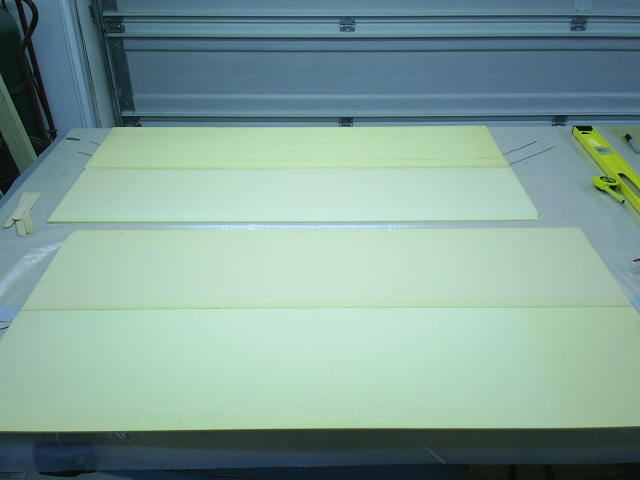 If you are not familiar with the popular duct tape hinge method of joining two pieces of foam together, check out Wayne hicks site to learn it. Very simple and will be used extensively throughout the build. Also, do add the 1/4" to the bottom of the IP, even if you have to add it with the method above. Also, make the width of the foam between the legholes 3.8" wide, not 3.5". This is from FAQ 4.22 on Marc's site. You should have all these FAQ's bookmarked and go over them well before, during and after each step is completed. Go to this site, www.ttcse.com/cozylinks/ for all your research needs. It is most valuable, probably one of my most used sorces of reference. Thanks Kraig! I appreciate the info. I'll make it a point to do more research before I get started from now on. I'll post more when I make more progress. I think I cut mine into five pieces. Glue any number of pieces together, make it look like the [final] picture. If you fear you're gonna bust up the IP foam handling it before it gets glassed, just cut the major holes out. Cut the smaller ones once it's glassed. 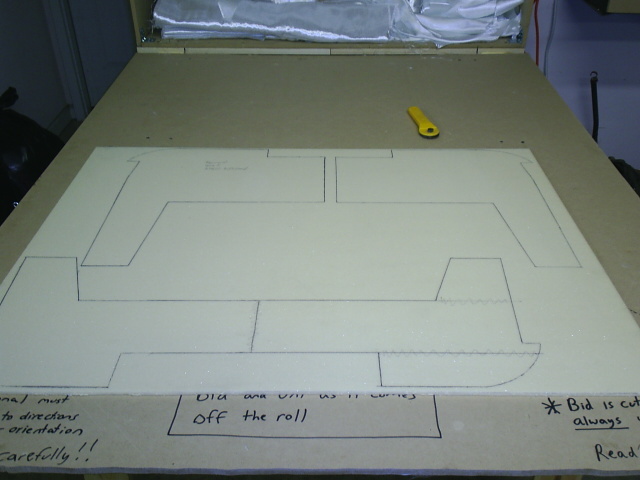 Do make the IP a bit longer on the bottom, sanding the excess off is trivial to adding additional foam once it's done. Mine came out about 1/4" short at the OS edges, flush in the center. Sand/trim the angles at the bottom corners slightly large too, you can trim them to fit when you assemble the sides... easy. Cut the seat back map and heater duct slots narrow and short, trim to size in Ch 6. Yes, bookmark Tom Tugan's site. His links make it *real* easy to drill down to the chapter at hand. Before laying out and cutting F22, flip to last page of CH4. 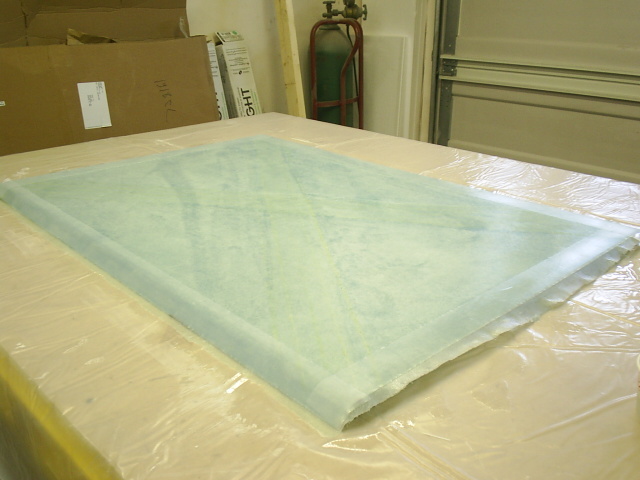 The first photo shows a different method of laying out F22. 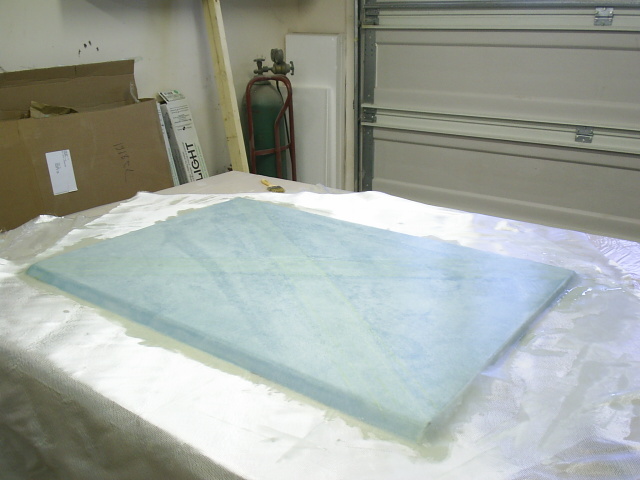 It shows that it's possible to make F22 out of one piece of foam instead of the plans method of two. 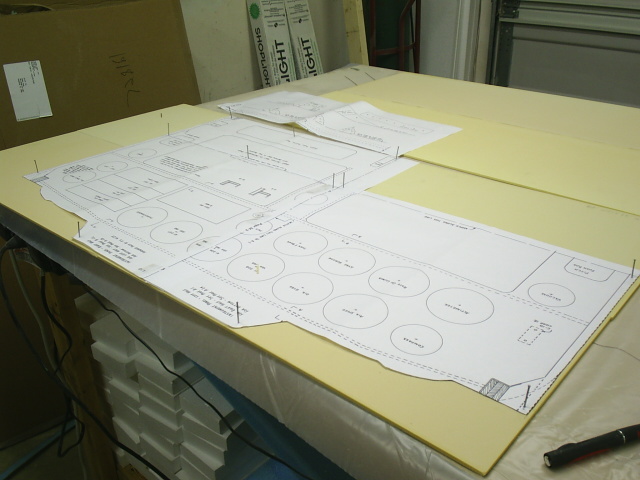 It involved more work to micro the pieces together, but at $20 a sheet it is worth considering. I didn't notice the photo until I finished the part. Looks like spilled milk. Beautiful. Yes, looks very nice! You do a nice job of keeping your work area clean!